What is a typical night at Joseph's House like? If you haven't visited Joseph's House to serve dinner one night, you might be curious to know what a typical evening is like. Program Director Tricia Bradly sat down with Pete, a guest at Joseph's House, to get a better understanding of a typical night. Pete shared that at 8:00 pm he and the other guests for the night arrive at Joseph's House, check in, and prepare their cots for sleeping. All guests have the opportunity to shower and wash their clothing, and Joseph's House provides donated hygiene products and laundry soap. Pete and other guests socialize in the dormitory area and dining room, and eat dinner around 9:00 pm, when it is served by Joseph's House volunteers. During and after dinner Pete chats with other Guests and Volunteers and helps out with cleaning up the cafeteria. Joseph's House staff check on guests and provide case management services to help guests connect with social services. Pete likes to go to bed by 10:00 and rises at 5:30 am. In the morning, breakfast is served and Pete, along with other guest volunteers, helps clean the dorm area. Every morning guest volunteers move all of the cots, sweep and mop the floors, and place the cots back in position. Surprisingly, things run very smoothly - thanks to the great work of the Staff, Guests and Volunteers. Our cafeteria received a fresh makeover thanks to Rutgers Future Scholars, their leader Michael D' Italia and Artist Brother Mickey McGrath, OSFS. 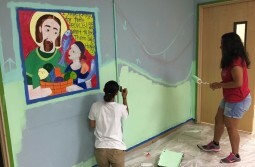 The murals had been previously painted by high school students and Brother Mickey but the walls were in need of a new coat of paint. Brother Mickey laid out a wonderful design with 4 colors and the students from the Future Scholars program wonderfully painted the room. Thank You for the true team effort! The bright and cheery atmosphere brings comfort to the Guests of Joseph's House. Through the generosity of the Cooper Foundation some of our staff and volunteers were treated to the Camden Rising Concert held on July 28th. Despite the rain everyone enjoyed themselves in the fun, friendly atmosphere. They were treated to the sounds of Lenny Kravitz, Lady Gaga and DJ Jazzy Jeff. We are so grateful for the constant compassion of our volunteers who give selflessly of their time and energy. Thank You for helping us make Joseph's House a compassionate place to call home for so many.